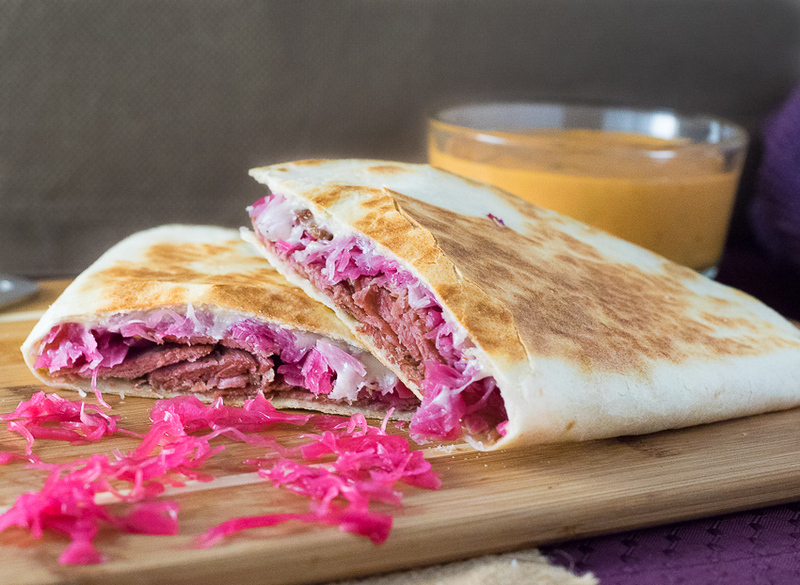 No doubt you’ve enjoyed many Reubens in the past, but have you ever eaten a deliciously simple Reuben Quesadilla? All of the classic Reuben flavor you love in a crisp tortilla with plenty of melted cheese! Rather than the classic Corned Beef and Cabbage, making Reubens are a St. Patty’s Day tradition for me. After all, does anyone really actually like Corned Beef and Cabbage? There is a reason why those snakes fled Ireland! If you are looking to learn how to make a Reuben sandwich, I have the recipe you need right here. In no time you will be churning out tangy sandwiches as good, if not better than your favorite restaurant’s. However, if you purchase a large cut of corned beef (I recommend the flat cut, it is less fatty and easier to slice), you will likely have some left over. 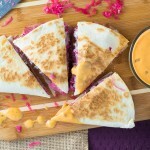 Though there isn’t anything wrong with eating Reuben sandwiches for three days straight, this Reuben Quesadilla is a great way to switch it up! Whether you are making a Reuben Quesadilla or a sandwich, I highly recommend trying your hand at making your own homemade fermented sauerkraut. It isn’t difficult and I promise it will be the best tasting kraut you’ve ever eaten! When making a quesadilla, some people bust out one of these bad boys. Personally, I think they are a complete waste of money. I use a simple non-stick skillet for making my quesadillas. (I own, and highly recommend these) The only difference is that you have to flip the quesadilla once, not exactly earth-shattering! The above link is an affiliate link. 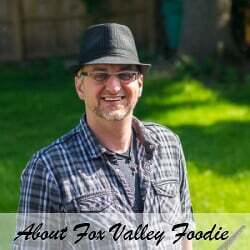 Any Amazon purchase make through this link helps support FoxValleyFoodie.com at no additional cost to you. 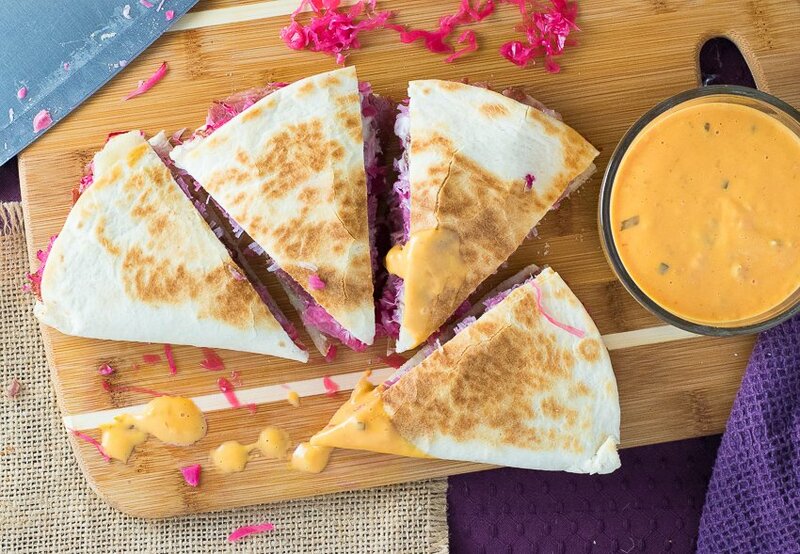 You've enjoyed many Reubens in the past, but have you ever eaten a deliciously simple Reuben Quesadilla? All of the classic Reuben flavor you love in a crisp tortilla with plenty of melted cheese! Heat corned beef in a pan on medium heat till warmed, remove and do the same with sauerkraut. Lay open the tortilla and lay corned beef on half of the tortilla and then pile with warm sauerkraut. Top sauerkraut with enough Swiss cheese to cover the filled half of the tortilla. Fold tortilla shut and place in skillet on medium low heat. Cook till the bottom is brown and then flip and repeat. The quesadilla is done when cheese is melted and tortilla is nicely browned. Cut into quarters and serve with Thousand Island Dressing. Use more or less corned beef as desired. I used 8oz in the pictures shown, but I cut down the recipe because I realize that makes a larger Reuben quesadilla than many people would want. If you have the heat too high the tortilla will brown before the cheese melts. To correct this turn the heat on low and cover the pan with a lid. If you enjoyed my Reuben Quesadilla recipe then you should probably like me on Facebook and follow me on Pinterest too. That’s what I would do at least, because if you don’t get to know me but you still use my recipe it is kind of like taking candy from a stranger, and your mom taught you not to do that. Don’t disobey your mom, subscribe to Fox Valley Foodie today.